Check the amount of window washer fluid. Look for 1/2 mark on the reservoir. If the washer fluid is low, the indicator appears on the instrument panel. 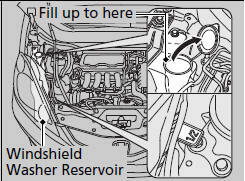 Pour the washer fluid carefully. Do not overflow the reservoir.